Ranks Report shows you changes of app position within the search category. On the picture above you can see the information about Prisma. It’s marked in yellow because it was tagged as Favorite ★ in the collection. First, there is app data from App Store for two countries: United States and Russia. 8 🔼 1 — Prisma is currently on the 8th place in category Free Photo & Video (the United States), which is 1 position higher than on previous day (or week). 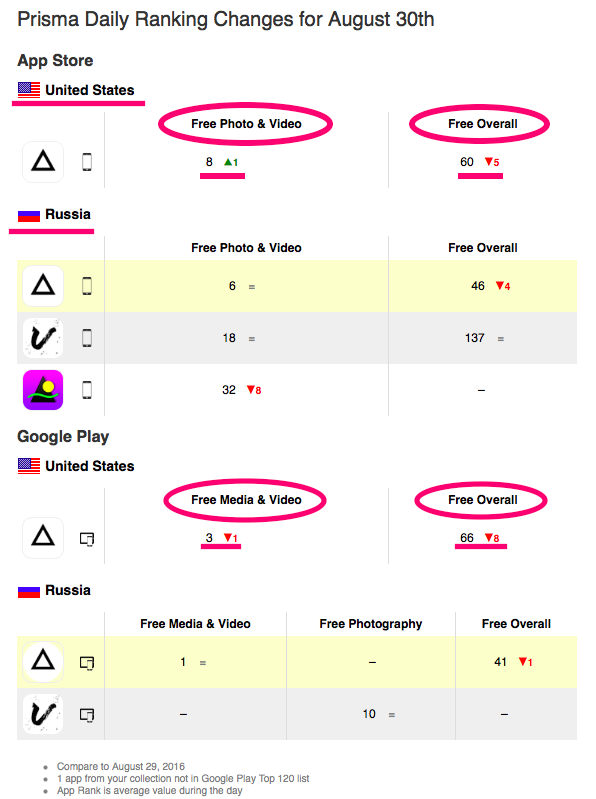 60🔻5 — Prisma is currently on the 60th place among all free apps in the United States. The app lost 5 positions in comparison to the previous day (or week). = — App position is the same as it was on previous day (or week). Under the App Store data, you will find ranks from Google Play. There Prisma is a part of Free Media & Video category. With this report it’s easy to track changes in category top and monitor where competitor’s apps belong to. Maybe it’s better for your own app to be in other category where it will attract more target users. It’s important to know that currently AppFollow is collecting data only for TOP 200 Apps in App Store and TOP 120 in Google Play. Windows Store is not yet supported in this type of report.